'Pixie Kisses' (Anthony and Dorothy Willott, R. 1999). Seedling #W 94-17. MDB, 4" (10 cm). Early bloom. 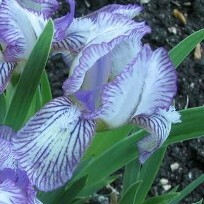 White ground, lightly stitched red violet; style arms light violet; beards white; lightly ruffled. 'Sand Run' X 'Cretica'. Willott 1999.
jpg IMG_3158-X2_pixie_kisses.jpg manage 143 K 17 Feb 2016 - 04:30 BrockHeilman Please contact Brock Heilman for image use.